One of the most striking characteristics of this year’s election is the extremism of its rhetoric, particularly on the Republican side. Current and former candidates such as Ted Cruz and Ben Carson carry their own brands of crazy (Carson famously claimed he tried to stab his childhood friend, and Cruz recently declared that all Muslim neighborhoods in the U.S. ought to be patrolled), but no candidate has quite matched the timbre of Donald Trump. Trump came out swinging when he called Mexicans rapists, and things like his refusal to condemn the Ku Klux Klan and the overtones of violence at his rallies have drawn comparisons to everything from Adolf Hitler to the bone-headed commander in chief in 2006’s Idiocracy. And yet, despite these characterizations, Trump keeps winning. So far, Trump has won a total of 758 delegates (to become the Republican nominee, a candidate needs 1,237). There’s no question he’s a demagogue, and he’s found that a not insignificant number of Americans are susceptible to his message. 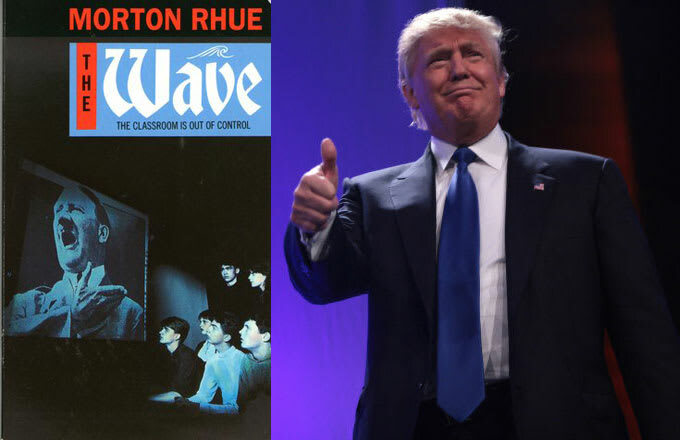 Trump’s rise speaks to the same kind of groupthink at the center of Todd Strasser’s 1981 young adult novel, The Wave (originally published under the pen name Morton Rhue). The book, which is a fictionalized version of a real event and is commonly taught in middle and high school classrooms in the U.S. and abroad, tells the story of a school experiment gone awry. Set in California in 1969, The Wave begins with Ben Ross, a well-meaning history teacher, implementing a lesson to give his students a better understanding of Nazi Germany. He founds a made-up group called the Wave, whose motto is “strength through discipline, strength through community, strength through action.” Although it begins as a benign way to improve classroom performance and school morale, the Wave quickly spirals out of control as it seeks to silence anyone who opposes it. The novel was intended for a teenage audience, so of course everything turns out all right: Ross stops the experiment, tells the students how much they’re acting like Hitler Youth, the students snap out of it, and everyone walks away with a new understanding about how single-minded ideology can wreak terrible havoc. Of course, real life doesn’t always work out so neatly. Strasser sat down with Complex to talk about the idea behind The Wave and how it relates to modern politics. What kind of response did you get to The Wave when it first came out? It fairly quickly became required reading in Germany, and it still sells hundreds of thousands of copies there every year. But what I didn’t realize at first was that the book was gradually picking up an audience in the United States, and now it’s used in a lot of classrooms here as well. It’s a timeless message, and I think it’s an important story for students to hear. Like any demagogue, TRump’s promising what he thinks the People want to hear. Throughout the book, it’s interesting to watch Ben Ross go from reluctant leader to someone who appoints one of the students to be his bodyguard. Can you talk a little bit about his evolution as a character? At the beginning, I think for altruistic reasons, Ross is looking for a way to help his students, but I actually don’t think he’s quite as reluctant as you say he is. He might start out that way, but I think—just as with people like Trump—he comes to enjoy the power and the attention that comes with his position. That’s part of the message: That the demagogue, even if he begins as a reluctant demagogue, grows to love the way it feeds his ego. It’s hard to stop. But in the end, his altruistic streak is essential; it’s the only reason he dissolves The Wave. What would happen if he’d allowed it to continue? You’d have World War II Germany. You mentioned Trump—how would you characterize him in this election? I think he’s an out-of-control narcissist. This is the best TV show he’s ever been on, he’s getting the highest ratings he’s ever gotten, and he’s digging every second of it, I’m sure. Of course, he also wants to win. And I hate to say it, but he’s smart. Look at his slogan: “Make America great again.” It implies that America has lost the greatness it once had—he’s tapping into that feeling among people. Like any demagogue, he’s promising what he thinks the people want to hear. Why do you think people are receptive to his message now? It’s a reflection of this country. These things tend to happen in times of insecurity. 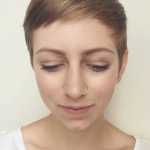 The Wave takes place in the 1960s, and even though it was supposed to be a time of sexual liberation and freedom, I think for many people it was also an uncomfortable time. People didn’t know where the country was going, they didn’t know where the kids were going, they were burning draft cards, they were against the war, and they were taking drugs. I’ve often thought that even though those things aren’t specifically addressed in The Wave, that’s the milieu in which the story was told. We have a human need for security—for life to be reliable and predictable and for the plans we make to come true—and I think that today we have that same sense of insecurity as far as where this country’s going and where the people in this country are going. In the book, there’s a scene in which Ross marches into the classroom and begins to give his students strict orders for the first time. They describe feeling an electric sense of energy from following his orders and acting together as a class. How do you think that’s mirrored in Trump’s campaign? Again, it has to do with a sense of security. If the students are doing everything by rote they don’t have to worry about the future, and they can focus on things like improving their grades, improving the football team. It’s like Trump saying, “Hey, listen, you’re not going to have some immigrant take your job. We’re going to build a wall, and the immigrants won’t come in. You don’t have to worry.” What does the Wave do? It offers false promises. But we love to hear them because we find security in them. If we know they’re false, why don’t we question them? There’s a line in the book where Ben Ross talks about how, once the Wave has taken effect and his classroom becomes an orderly community in which students stand by their desks to give answers, the answers they give him are learned by rote. He says there’s no analysis—no questioning on their part. And I think one of the big connections between the book and what’s going on today. Do you think Trump has the markings of an extremist leader? In Nazi Germany people were frightened into agreeing with Hitler, but I don’t think we’ve reached the point where people are being frightened into voting for Trump. At this point, it’s more like a TV show. Trump is getting great ratings. People are tuning in—they love it. They’re glued to this stuff. What’s the difference between Trump and the Real Housewives? It’s entertainment.